For the mom who’s passionate about riding: The Ladies’ Deluxe Wetsuit is perfect for this time of year. The weather is warming up, but the water still has that spring chill to it. This wetsuit will help her stay comfortable and warm in varying water temperatures, and also provides free movement of the arms. If she needs a little added protection, pair it with the matching Ladies’ Deluxe Jacket for a luxe feeling and stylish look. Along with her new gear, be sure that she’s fully protected with a PFD of her choice. If you are looking for a PFD that combines great value with high quality, we suggest the Ladies Vibe PFD, made with super-duty nylon. It has large armholes that allow for free-arm movement. If you want to offer her the crème de la crème, there’s the Ladies’ Airflow PFD, made with fast-drying ecoprene. It gives a comfortable fit thanks to stretch lining fabric and mesh drain panels. For the mom who’s sure to take a Dip: If she likes to alternate between tanning sessions and refreshing dips, the Splash Bikini Top is ideal. It offers great support, dries quickly and looks very flattering when worn with the Ladies’ Pulse Boardshorts. The boardshorts are also made with an ultra lightweight fabric and quick-dry fabric. Comfort and class rolled into one great simple outfit! For the mom that loves weekend getaways: For a nice relaxing weekend at the cottage, a family trip or any kind of getaway, the chic Breeze Dress and Sea-Doo Signature Tee pack away will give her a stylish look as everyday casual wear. No matter what kind of Mother’s Day she’s looking for, whether it is adventurous or relaxing, these suggestions make great gifts that she’ll enjoy beyond just one day a year! It’s never too early to plan your big summer adventures. There are many things to think about when getting ready for a long sea excursion. It requires thoughtful planning, sound physical riding ability and increased vigilance. 1) Know yours and your machine’s limits and think safety at all times. 2) When cruising the seas from one destination to another, choose to go with a flotilla. There is safety in numbers. Ideally, a large boat will break the seas for a smoother ride and add extra safety. 3) Timing as always comes down to Mother Nature. Times to avoid are windier months or months that are known for heavier storms that can make seas pretty rough. 4) Before the journey, don’t let your miscellaneous items go to the wayside when doing your prep. Items like your passport, medication, and credit cards may seem like obvious things to remember, but best add them to your checklist, just in case. 1) Safety Equipment – A watertight flashlight, Replenished Fire Extinguisher, and First Aid Kit are great starts to have on your checklist. We recommend reviewing and following the recommended list by the USCG. 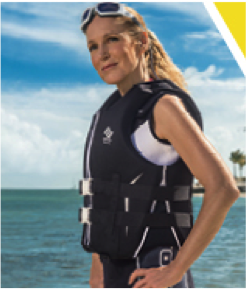 The Freedom PFD is incredibly durable and made for maximum comfort with anatomically cut armholes. They also have a goggle-to-PFD attachment cord so that your goggles stay with you throughout the ride. The Sea-Doo Riding Goggles will help keep your eyes from drying out and the polarized lenses are sure to enhance the magnificent views. 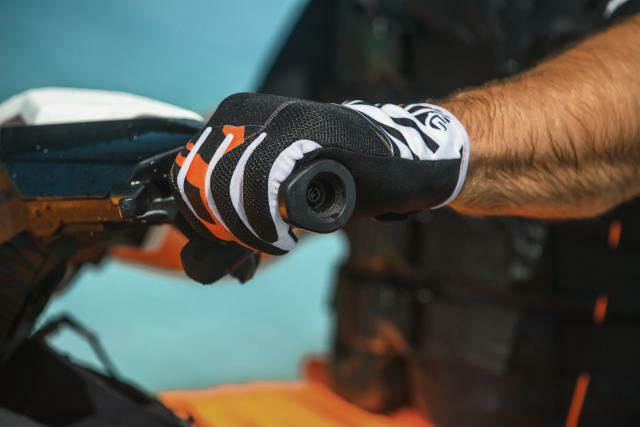 The Attitude Full Finger or Shorty Vehicle Gloves not only protect against wind, but also provide maximum grip. Variations in wind can make the ride less pleasant if you’re not properly prepared. 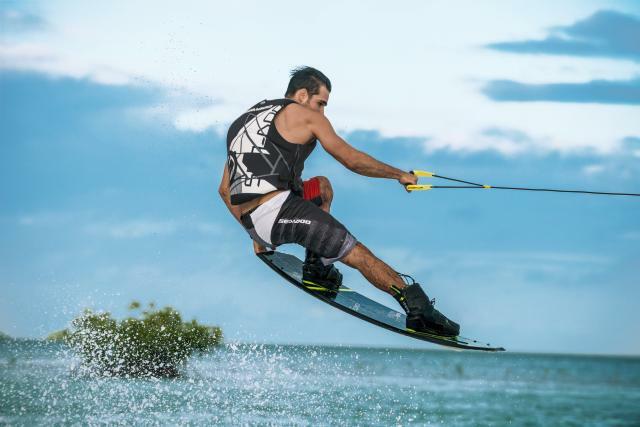 The Sea-Doo Water Shoes will add extra support thanks to their anti-slip features. 3) Convenient accessories –Among the basics, we recommend adding a Handheld GPS along with some extra batteries. 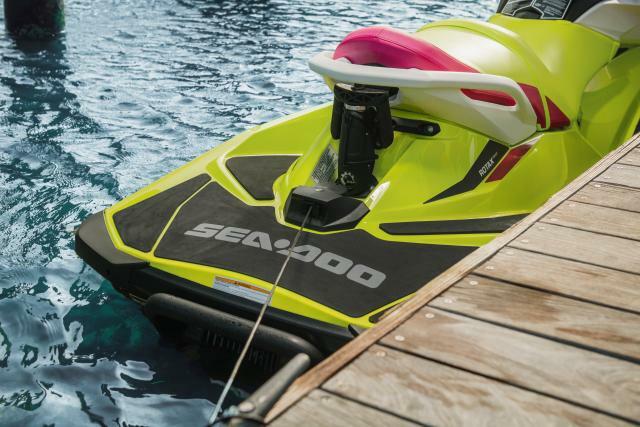 A sandbag anchor will be sure to come in handy when a break is needed, and the Sea-Doo Speed Tie and Snap-in Fenders will help you be ready for easy docking once you make it to your destination. A mantra to live by when prepping for these types of trips is that you can never be over-prepared. 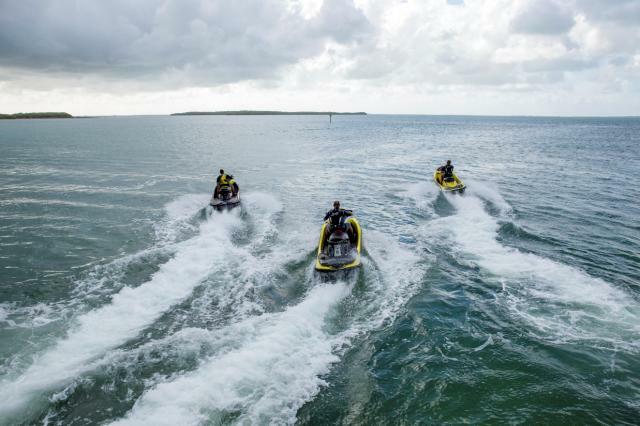 Build up to your sea excursion with long watercraft rides. Find out what kinds of surprises you run into and learn what to be prepared for!